Looks like all systems are go for Catherine to head back to the OR tomorrow. She’s scheduled for 1 PM, though they may take her as early as 11:30 if they can get schedules to align. Docs have done all they can to figure out what caused the anaphylaxis on Friday. Neuro and Cardiology have ruled out seizures and heart problems. And the anesthesiologist said her lungs are so strong they’re probably what kept her out of really serious trouble. So, the strongest hypothesis is an allergic reaction to some meds or blood products. Trouble is that they’re not able to isolate the culprit precisely. They have some strong contenders, but cannot know for sure. That means they’ll avoid as many meds as they can in the cocktail they used on Friday, though some can’t be avoided. And of course, they can’t control for the blood products. So, you know that quote that says, “Leap and the net will appear”? That’s sort of how this feels. Especially after hearing Dr. Miller’s resident round on Monday and say he just wanted to check in because he was in the OR with her when it happened. “She’s made a miraculous recovery.” “Miraculous?” I thought. I didn’t realize it was quite that serious. When I mentioned it to Dr. Miller though, he didn’t disagree. OK – We’ll be looking for that net! Dr. Miller and Dr. Theroux (anesthesia) have consulted each other numerous times, and I’m glad we’ll have the same team in there with Catherine. They’ve worked together for nearly 25 years. They’ll be acutely aware of any issues and have a solid plan which makes me feel more confident. Though I promise you that every single time the OR nurse comes out to give us an update, we’re going to be hanging on every word. I’m incredibly thankful that they were able to extubate Catherine yesterday and she has had some time to breathe on her own. It was amazing to watch, actually. The night the respiratory therapist came in to do a trial to see if she could breathe on her own, she tried three times and Catherine would start out OK and then stop breathing. It was so frustrating – and frankly incredibly disheartening – to watch. I asked her to try again. She said, “Well, she’s already failed three times.” I think she could see something in my face because she agreed to try again. And this time, she did something different. 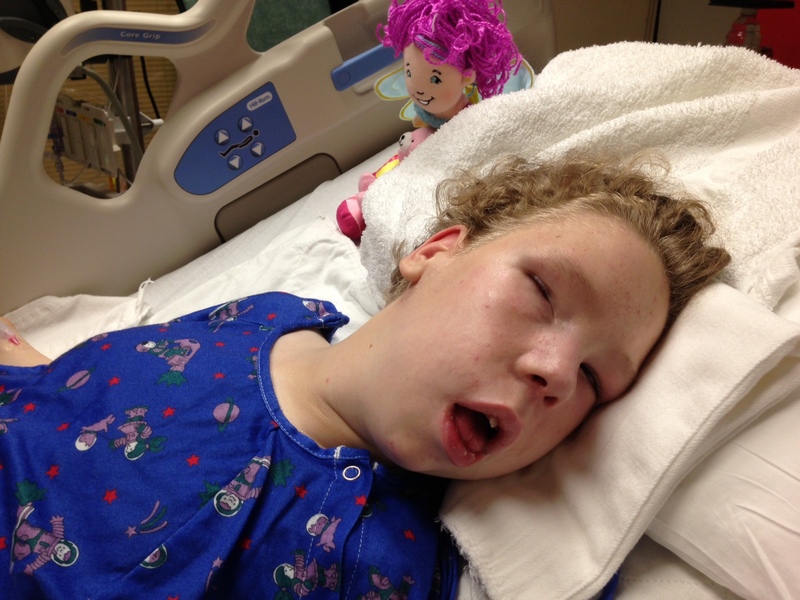 She created “a leak” in the balloon closing off her airway. I’m not sure I understand the physiology of how ventilators work, but as soon as she did that, I watched Catherine take a breath and I could tell it was HER breath – not a machine’s. Her belly just rose differently and I realized I do, in fact, know my daughter. “That’s her breath,” I said with excitement growing in my heart. “Good job, Catherine. Just keep breathing. You got this.” And sure enough, she did. Every single alarm through the night woke me, though, and I jumped up to see if it was her respiration that was alarming. Often it was alarms next door or a med running out. Nothing that mattered as far as I was concerned. As long as she kept breathing, anything else could alarm. It may be odd to read that I realized in the moment she took a breath that I do know my daughter. You have to understand. Since she was in the NICU, the nurses would say, “You know her better than we do.” She was only days old – how was that possible? They had all the numbers and charts. Her nurses at home watch her solely for hours. And because Brian is her main caregiver – and such a good one at that – I sometimes wonder if I really do know her. He’s able to read her subtle cues so much better than I am. But in the dim light of the ICU, I saw her belly rise and fall and my gut instantly knew. That’s my little girl breathing. And everything will be just fine. Not even one single little tube! No vent. No nasal cannula. No NG tube. Nada! Boy does she look beautiful to me. I learned something pretty cool from one of the volunteers at this hospital. You can go online to the hospital website and send Catherine an e-card that they actually print and hand deliver M-F. I’ve not done it yet, but so many of you have asked if there is anything you can do so I thought this could be kind of fun. I also just wanted to let you know how absolutely amazing this hospital is! The ENTIRE TEAM is simply wonderful. I’ve never heard so much laughter in a hospital – and certainly not in an ICU. I think that’s got to be good for the kids. In fact, when I walk onto the unit, I feel like it’s a place for healing rather than desperately trying to save lives. If you’ve been in other PICU’s, maybe you understand what I mean. This place just feels different. Everyone – custodial staff to best-in-the-country doctors – smiles and says hello and has the best attitude. You know I’m in advertising, so I pay attention to things like mass communication. AI duPont’s tag line is “Your Child. Our Promise.” It’s everywhere – screensavers, posters, radio commercials. It’s remarkable how they live into that idea with every single interaction. They really care about the whole family and work to involve parents in the care of their kids. We even get to participate in rounds – and it’s not just lip service. Monday, when they rounded on Catherine, they talked about taking her off Tylenol. That’s all she’s on for pain. I couldn’t fathom her not having something in her body to ward off the pain from such a huge incision, so with a little concern about whether I’d actually be taken seriously, I said something. “Uh – she’s only out of surgery 3 days, can we please keep Tylenol on board?” Sure enough – they did. I hope you never need a hospital for your kids. If you do though, I hope you can find your way here. It really is a special place and I endorse it completely. Because of that, and the incredible care Catherine has received and the top-flight docs and nurses and entire team, we head into the OR feeling like we’ve got a net. In a few hours, it’ll be time to leap.